On Thursday, January 12, 2012, Major League Soccer's New England Revolution selected Creighton University and Generation Adidas Left Back Tyler Polak with the 22nd Pick. Tyler had little time to celebrate in Kansas City with his parents, brother, teammates, coaches and friends in attendance, as he had to return to Lincoln, Nebraska to pack, say goodbyes to family, friends, teammates and coaches before flying to Boston Sunday to begin pre-season Monday. Tyler joints the Revolution without an incumbent sure-fire starter at the left back position and will learn the position at the professional level under former U.S. National Team and MLS All-Star Jay Heaps who also played the outside back position. Combine that with the presence of U.S. National Team and World Cup Veteran Outside Back Michael Burns in the Revs Front Office made the Revolution one of the best fits for Tyler. Please enjoy some pictures and videos as well as some online articles from the MLS SuperDraft and Tyler's MLS Combine Highlights. A sample of some of the online media discussing Tyler Polak and the New England Revolution's 2012 MLS Super Draft picks are after the jump. With the 2012 MLS SuperDraft now in the books, the writers at New England Soccer Today handed out their grades for the New England Revolution’s 2012 draft performance. The Revs selected UCLA midfielder Kelyn Rowe with the third overall pick and Creighton defender Tyler Polak with the 22nd overall pick. First of all, the signing of Tyler Polak was huge. Not only does it give the Revolution a left back, which they haven’t had in a few years, but it also gives them more salary cap freedom since he is Generation Adidas. I certainly didn’t expect to see Polak available at number 22, which makes him a steal for the Revolution. On the other side of things, the Revolution still don’t have a goal scorer. Yes, Kelyn Rowe is a great offensive talent but he isn’t the player that is going to bring this team 10-15 goal seasons. Should Rajko Lekic and Nate Jaqua choose not to sign, the Revolution will be in deep trouble when it comes to offensive depth. Not selecting Chandler Hoffman, Sam Garza, or Casey Townsend may come back to haunt them. But nevertheless, Rowe deserved to be a top five pick going into the draft. He has played for UCLA, the largest producer of MLS players, trialed with FC Koin of the Bundesliga, and played in the U.S. youth national team systems. He may be the next Steve Ralston or Benny Feilhaber. All in all, two solid picks, though it would be nice to have a forward that can make the combined efforts of Rowe, Benny Feilhaber, and Shalrie Joseph count. Quick: name a striker who scored ten goals in MLS last season that was a product of ANY SuperDraft. Struggling? That would be because – if we discount Brek Shea for being a midfielder – of the 14 forwards who scored 10+ goals in 2011, only one joined the league via the SuperDraft: Dominic Oduro. Oduro was a second round pick in 2008 and has already bounced around four different teams. He had never scored more than five goals before last season. Why start with that reminder? Because many have expressed disappointment that the Revs didn’t address their obvious current deficiency at striker in the draft. The problem is the odds of finding a good MLS goal scorer in the drafts these days, even with a top three pick, is almost nonexistent. With such an early pick, the strategy has to be to take the best available player. The Revs did that with Rowe and in doing so added so much needed creativity to a midfield that is lacking in offensive weapons. With the 22nd pick they addressed an immediate need at left back with Polak who may just turn out to be a steal so late. At the very least they provided needed competition for Danleigh Borman if he signs. Add in that the two players are Generation Adidas, don’t count against the cap and both are 20 or younger and it’s hard to see how the Revs could’ve done much better. 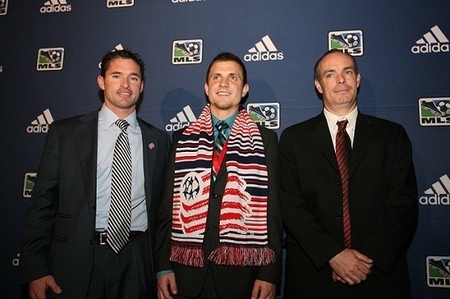 The Revolution was able to draft two, high-quality players in the 2012 MLS SuperDraft. With the third selection, the Revs took UCLA and Generation Adidas player Kelyn Rowe. Rowe, who is only 20, is a very solid midfielder who plays well with or without the ball. While he isn’t the biggest player on the field, he can cause damage as seen from his time at UCLA and at the national team level. The 5’8 midfielder will most likely get the majority of his minutes on the outside but should make an immediate impact. In the second round, the Revs snagged another Generation Adidas player in Creighton’s Tyler Polak. Polak is going to fill one of the major holes in the Revs at left back. The former Bluejay is a great fit for Heaps, who has previously stated he wants his outside backs to attack more, something Polak is good at. The reason this grade isn’t an A is because they didn’t get a pure goal scorer. The good news is that the Revolution drafted on the idea of “best player available” and came away with two solid players who won’t count against the salary cap. The Revs get a B+ for a multitude of reasons. The positives: that the picks themselves addressed two major needs, with Rowe adding creativity to a predictable attack and Polak giving the squad a legitimate left back. Plus, the Revs don’t have to pay either a dime, opening cap room to possibly re-sign Rajko Lekic and/or Monsef Zerka. Oh, and they didn’t fall into the trap of drafting a striker, a position that historically yields many more misses than hits in the SuperDraft. So on these fronts, the Revs were particularly shrewd. The only negative: they passed on Enzo Martinez, a playmaker who many felt has the talent to be a First Kick starter, in favor of Rowe, who may need some polishing before he’s a starting caliber talent. The third pick should deliver an immediate contributor rather than a “wait and see” playmaker, even if the latter has tremendous upside. On the whole, the Revs did well, but time will tell whether the Rowe-over-Martinez move comes back to bite them. After a 2011 campaign that saw its attack shut out 10 times and its defense victimized for 58 goals, the Revolution addressed two obvious needs by selecting UCLA midfielder Kelyn Rowe (third overall) and Creighton defender Tyler Polak (second round, 22nd overall) in Thursday’s MLS SuperDraft. Rowe is a technically-talented 20-year-old creative midfielder whose six goals and 10 assists helped steer the Bruins to a semifinal run during last year’s NCAA tournament. During his two seasons at UCLA, the 5-8, 150 lbs. playmaker totaled 13 goals and 20 assists and was named Pac-12 Conference Player of the Year in 2011. Polak is a 19-year-old left back who also helped his team to a semifinal run in last year’s NCAA tournament. The 5-8, 150 lbs. defender, who scored a goal and added five assists for the Bluejays last year, was part of a Creighton back line that allowed only five goals in 24 games and kept their opponents off the board 19 times in 2011. The addition of Rowe, a member of the 2012 Generation adidas class, should give the Revolution attack the creativity and ideas it desperately needed last season. Even with Shalrie Joseph and Benny Feilhaber on the field, the team had to rely on set pieces and route one ball to get the ball into the back of the net. With Joseph and Feilhaber locked in as the team’s starting central midfielders, Rowe, a classic number 10-type player, will likely find the majority of his minutes out on the wings or in the withdrawn forward spot. Even so, one thing head coach Jay Heaps raved about Rowe during the draft was his first-rounder’s versatility, which will certainly earn the former Bruin more opportunities to crack the starting lineup in 2012. Polak, another member of this year’s Generation adidas class, gives the Revolution something they lacked all last season: a true left back. After fellow Creighton left back Seth Sinovic was waived last March, the team used left-sided midfielder Chris Tierney and center back Darrius Barnes to hold down the left back spot -- with varying degrees of success. Though the Revolution drafted Danleigh Borman in last month’s Re-Entry Draft, he remains unsigned, leaving Polak the only pure left-sided wingback on the roster. Given the Revolution’s propensity to play its rookie defenders right from the start (see: Barnes, Sinovic, Kevin Alston and A.J. Soares), it wouldn’t be a stretch to see Polak earn a spot in the First Kick starting eleven. One of the underlying benefits of adding the Generation adidas duo is that neither player’s salary will count against the team’s salary cap, thus leaving enough room open to address another pressing need: its forward corps. With only one pure striker on the roster (Zack Schilawski), the additions of Rowe and Polak could have been exactly what the Revolution had in mind going into Thursday’s draft: selecting two talented players who not only give the Revs depth in the back and creativity in the middle, but also leave the team requisite wiggle room to go out and sign a high-priced, internationally-based striker. If Tyler Polak finds himself in the starting line-up on opening day at San Jose, the 19-year-old should hardly be caught wide-eyed. The New England Revolution’s second round draft pick has already faced Major League Soccer competition in a meaningful match and trained with several professional clubs. Polak, perhaps even more so than the Revs number three overall 2012 MLS SuperDraft pick Kelyn Rowe, stands a decent shot of starting on opening day. With Danleigh Borman yet to sign, Polak is the only natural left back currently on the roster. And if Polak is starting, his experience should help alleviate any rookie nervousness. With the Chicago Fire Premier (PDL) last summer, the Creighton University product started at left back as the Fire Premier won two matches in the U.S. Open Cup to earn a match-up with Sporting Kansas City at the beautiful Livestrong Sporting Park less than a month after the stadium opened. While the Fire Premier lost 3-0 to their MLS opposition, Polak went 90 minutes on the road against MLS opposition in front of nearly 4,500 fans. If that’s not enough to cure potential opening day nerves, the rookie has also trained in Germany with Borussia Mochengladbach and Hannover 96, in addition to reportedly training with Sporting Kansas City. With that experience in mind, there is little reason not to take the U.S. U-20 International at his word that he’ll be ready when the Revs open preseason training on Monday. The youngster certainly has an unusual amount of experience for a college sophomore and that should serve him well as he transitions to the professional level. His remarkably high playing time in Creighton’s busy season should also help prepare him for a strenuous MLS season. Polak started all 24 of Creighton’s matches in 2011, and led all field players on the team with 2,173 minutes, just thirty-six minutes less than the 2,209 the team played. In comparison, only four field players on the Revolution saw more than 2,173 minutes last season. 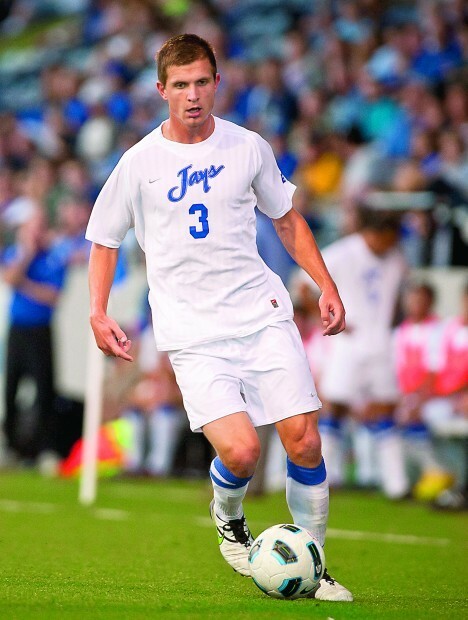 The 5-foot-8 defender impressed with his ability to add to the attack out of the back, contributing a goal and five assists to Creighton in 2011 while the team won the State Farm Missouri Valley Conference Tournament Championship. With Chris Tierney or Darrius Barnes playing out of position at left back last season, the Revs lacked much contribution on offense from that position. Polak’s remarkable year also saw Creighton advance all the way to the NCAA College Cup Semifinals before falling to Charlotte in penalties. Creighton finished the year with an impressive 21-2-1 record, including a perfect 14-0-0 record at home, while allowing just five goals all season. His impressive college resume isn’t so different from another standout college full-back who was a top pick in the SuperDraft 13 years ago – Jay Heaps. Heaps, now the Revs head coach, was named rookie of the year his first season, playing 2,511 minutes for the now defunct Miami Fusion. He would earn an All-Star nod the next season, before being traded to his home team Revs in 2001. Though Heaps was nearly three years older than Polak when he entered the league, he should prove the perfect role model and mentor for the Lincoln, Neb. native. In addition to sharing a similarly small stature, the two also share a propensity to contribute to the attack and both have seen time in midfield. On paper, Heaps as head coach appears the ideal fit for Polak’s development. Now it’s up to Heaps to decide if Polak deserves the same faith and playing time the 35-year-old received himself as a rookie. Revolution second-round pick Tyler Polak, out of Creighton, is presented to the media at Thursday's MLS SuperDraft. Polak, a Generation Adidas player, was pick number 22. Thursday marked yet another MLS Super Draft, but it was one with huge significance throughout Revs Nation: the players selected would be the first under new head coach Jay Heaps. Massive amounts of excitement were attributed to the fact that the Revs had their highest pick in almost a decade at #3, and with several holes to fill, this year's Super Draft was of utmost importance. With all of that being said, my gut reaction is that Jay Heaps, Mike Burns, and Bran Bilello did an extremely good job here. No surprises, two solid draft picks, TWO Generation Adidas picks, and both assessed a need and were the best players available in both both instances. So, without further ado, let's meet the new boys in blue, UCLA superstar Kelyn Rowe, and Creighton's defensive standout Tyler Polak! Kelyn Rowe is going to be much more familiar to fans of the Revs (I wrote a preview piece in early December here on The Bent Musket and you can read it here) and there is certainly no shortage of accolades and acclaim for the Bruin midfielder. Recently named the Pac-12 player of the Year, Kelyn will have very little problem creating an impact on a Revs team that saw several lengthy stretches of a lack of offensive creativity last season. Rowe has often stated that he is looking for a coach that will allow him to play with a creative freedom going forward, and if you caught coach Heaps' interview on the ESPN set this afternoon, it seems as if he's completely satisfied with creating and cultivating a much more aggressive and offensive minded philosophy on the field in 2012. With Feilhaber and Joseph already in the mix, Heaps stated that they weren't sure where he would play, but it sounded like Rowe is in his immediate plans in the Revolution midfield. Although Rowe isn't an incredibly imposing figure (listed at 5'8"), he plays much stronger than expected, with good balance on his feet when he fights through traffic. New England absolutely lacked creativity last season, and with Rowe pairing up with Benny and Shalrie in the middle of the park, it's hard not to get too excited about the prospects of those three teaming together, and quite frankly, what two better veterans could you find to bring along a young midfielder? The selection of Tyler Polak certainly came as a surprise to several bloggers an writers in Revs' circles, not so much for the selection, but the fact that a solid, Generation Adidas defender fell all the way to #22 in the draft. Polak was the only natural left-back in the draft at that point (a HUGE hole in the Revolution lineup) and after a standout season with Creighton in which he led the Jays to an appearance in the College Cup semifinals, this was clearly an outstanding pick for New England. Polak is listed as 5'8" and 150 lbs. on the school's website, but after seeing him in the flesh on the draft broadcast today with Heaps and Mike Burns (he stood taller than both) I'm beginning to question the listing. Polak plays very strong on the flank, and at times has the ability to create going forward as well. Polak played almost every single minute of the Creighton Jays' season in 2011, and with the Revolution's difficulties staying healthy at times, his sturdy frame and health certainly have to be viewed as a plus. Tyler Polak has a very attractive and seasoned pedigree with stints with the USMNT Residency program and U-17 squad, as well as the Chicago Fire Development Academy, playing for their U-23 squad in the PDL. When you add the recent success in the NCAA Tournament to his early successes on the field as well, it shows that Polak is not only a great player, but a winner, and there's no arguing that quality is needed in New England. All in all, New England has ended up with two very solid players, that not only possess the physical qualities desired, but the will and determination to win games as well. It's far too early to call this a home run for the Revs, but when you stack up all of the positives against scarce (if any) negatives, it's certainly just fine to see that the light at the end of the tunnel is shining just a little brighter in Foxboro this afternoon. Lincoln native Tyler Polak was picked by the New England Revolution in the second round of the Major League Soccer SuperDraft on Thursday. New England took Polak, who played for Creighton for two seasons, with the No. 22 overall pick. He's expected to compete at the left back position, an area where New England needed a big upgrade. "There were a lot of emotions (while waiting for my name to be called)," said Polak, who attended the draft in Kansas City, Mo. "I was really nervous, but it was definitely exciting when my name was called." Polak returned to Lincoln after the draft and will fly to the Boston area Sunday. Training camp begins Monday. The Revolution finished last in the MLS Eastern Conference last season with a 5-16-13 record. The Revs are based in Foxborough, Mass., and have reached the MLS Cup final four times, the latest coming in 2007. Polak decided to turn pro after his sophomore season at Creighton, becoming only the second Bluejay to leave early and get selected in the MLS Draft. "I talked to my parents and coaches, and we all kind of decided it was time to go," Polak said of his decision to forgo his final two collegiate seasons. He signed a Generation adidas contract one week before the MLS combine, which guaranteed he would be picked in the draft. Generation adidas was put together by the MLS and U.S. Soccer in the hopes of raising the talent level in the United States. Polak was named All-Missouri Valley Conference this past season as a defender, helping Creighton reach the NCAA Cup Final Four. Not only did he make an impact defensively for the Bluejays, but he also had five assists and a goal. Polak played at Lincoln Pius X his freshman season in high school. He then attended Bradenton, Fla., Prep Academy. There he received Parade All-America honors and played with U.S. national youth teams. Three other Creighton players were drafted Thursday — forward Ethan Finlay (10th pick, to Columbus), defender Andrew Duran (15th pick, to Seattle) and Greg Jordan (32nd pick, to Philadelphia). It took longer than many expected, but the New England Revolution cleared the Generation Adidas board by taking Tyler Polak with the No. 22 pick of the 2012 MLS SuperDraft. The Creighton product could very well earn playing time and even starter's minutes early on. Depending on who you ask, Polak was either a top-10 talent or a guy who was never worthy of a first-round selection. However, even those who fall into the latter category have to agree that Polak is likely to get a shot to play. MLS is a league that is not loaded with quality fullbacks. Any player with youth international experience who looked consistently solid at fullback at a major college program is likely to get a shot at playing time. Polak was one of the players who did not have a good combine, but he joins the likes of Tim Ream and Michael Farfan in doing so. Evaluating a player based on a few exhibition games doesn't make a lot of sense, and we can only hope that teams evaluated Polak's entire body of work. He's played two very good years at Creighton and has also played for the Chicago Fire PDL side, so there's a good chance that teams know a lot more about him than his average combine performance.